PUBLISHER: Sport Centers of America, Inc.
COVER: Win a trip to Monte Carlo. Enter the North American Backgammon Association $10,000 contest. 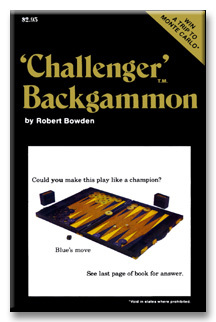 Details and entry form with ten backgammon problems to solve in back pages of book. Beat the author! 200 Problems with play boards and concealed answers. North American Backgammon Association, Inc., says "Great! Fun! Challenging for expert and beginner alike."